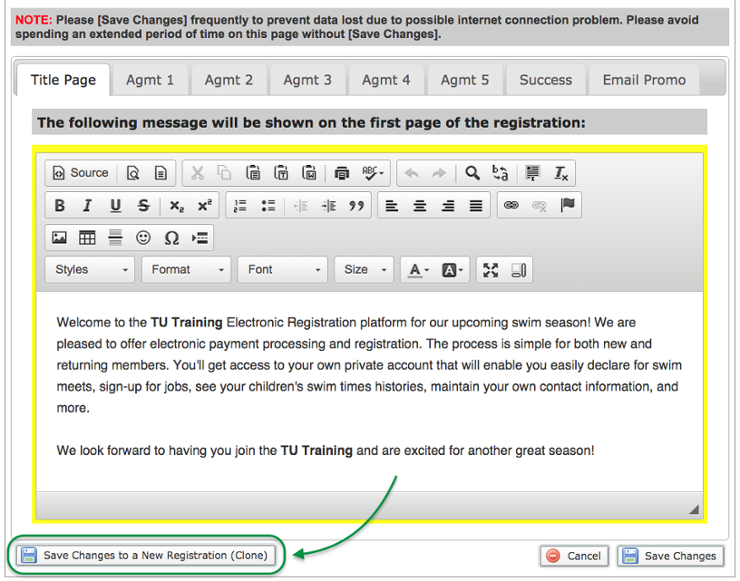 A great feature of the Online Registration portal is the ability to clone past registrations. Cloning speeds up the registration setup process and can help to keep consistency from year to year, registrar to registrar. If this is your first registration you can skip this step and go to the next lesson where we walk you through the basics of a new Online Registration. If this is your first time running an Online Registration, but your team has run previous registration that you want to reuse, let's clone that registration and later we will review its setup. In the side menu click Team Admin > Registration Admin. This will take you to Member Registration Admin. Click a previous online registration name (not the check box) you want to clone. This will take you to the Member Registration Setup page where we will rename and clone the registration. Set Turn on for Registration to NO - Disabled. Change the Open For Returning Members and Open For New Members dates to reflect when the new registration will be open. Scroll to the bottom and click Save Changes to a New Registration (Clone). This is similar to the "Save As..." function in various applications. No changes will be made to your selected registration, all changes/renaming now appear in your cloned registration in Member Registration Admin tab of Registration Admin. All information from your past registration, both Basic Setup and the Fees Setup area, are now cloned to a new registration. For any additional information on When To Clone Your Registration visit our Knowledge Base on Cloning an Online Registration. Now that your registration is cloned it is time to get it up to date and check over the setup to update any changes your team may make for the season. 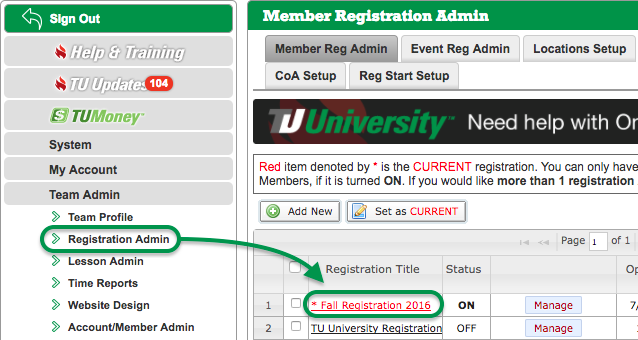 In the next step, we will take you through setting up your cloned registration starting with the Basic Setup page.